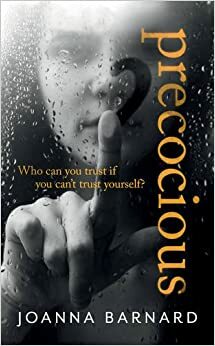 Review: Precocious | Live to read. Read to live. Oh but I’m late reviewing this book, mostly because it’s taken a lot of thinking about, a lot, because I really wasn’t sure what I wanted to say about it, or how to get across my complicated feelings about the subject matter without feeling like I saying bad things about the book, which I’m not, really. – it’s a funny feeling, enjoying a book but having negative feelings about the story and the characters and I swear I’ve gone forwards and backwards with myself about this one so many times that I feel a little seasick. I’m still not entirely sure I’m going to get this even remotely right, but, time and book reviews wait for no girl…. So, like I talked about earlier this month, I always feel weirdly guilty when I only give a book 3 stars; that totally feels relevant now because this is a three star review and here I am feeling like I need to whisper ‘but that’s a good thing’ because you know, it is. Joanna Barnard’s Precocious – let’s talk about it. What is it about the teacher/student relationship thing that people find themselves somehow drawn to? It holds this weird kind of morbid curiosity and why exactly is that? I mean, really, if we’re going to be perfectly honest the whole thing is spectacularly fucked up, and yet. And yet. Perhaps that’s what it is: the fact that it’s so taboo (and I don’t mean that weird fruity drink that you mix with lemonade and that I always kind of like whenever I have a curry) It’s the kind of thing that you can’t help but have an opinion of, that as a teenager you might see the romance of even though as an adult you’re (hopefully) more like ‘holy abuse of power, batman’ and probably it’s that that makes Joanna Barnard’s novel Precocious such an interesting concept. Fiona is thirty years old and married when she bumps into her former teacher Henry Morgan again, for the first time since school. Turns out Fiona and Henry had an affair when she was fourteen, and after that chance encounter in the supermarket 15 years later, it’s not long before they’re at it again and what follows is an interesting look at desire and morality and control. The book is told from Fiona’s point of view, both in the present day, and through diary entries when she was at school, which again is super interesting: the juxtaposition of 14 year old Fiona from then alongside 30 year old Fiona from now is a really clever way of telling the story. As a whole though, I’m kind of on the fence about it, I think. I mean it was an interesting take on the student/teacher thing and it wasn’t badly written at all – the opposite in fact: Barnard is A Good Writer. The whole first person narrative as Fee tells her story, not to the reader but to Morgan, is really rather excellent and very very effective. Oh you know what, have a quote, lemme share some pretty words. Your initials. I see them in car registrations and my heart skips a beat. I seek out the letters H and M in newspapers and draw them together with my eyes. So, there were parts of it that were really good, that had me smiling a little in recognition; some of Barnard’s insights into love and relationships and humanity were spot on and I do rather like the way she writes but, I don’t know…it made me kind of uneasy. Perhaps it was supposed to. I really hope that it was supposed to. Uneasiness aside – I’ll come back to that later - I struggled with Fiona, which was a problem because a protagonist you can’t quite get along with always makes a book harder to read. She just felt like a really young thirty. She’s only two years younger than I am now, and I am damn sure that my head was a hell of a lot more screwed on two years ago than Fiona’s is. She made so many questionable choices and was so naïve and so very willing to bury her head in the sand and I just, I really wanted to shake her. Open your eyes woman, because this guy was shagging you when you were fourteen and he was responsible for your wellbeing and even if you couldn’t see how fucked up that was then because you were a child, surely you can see it now?? As for Morgan, well, he just creeped me out. As creepy villains go, he was pretty top notch without even trying and without even being particularly villainous (apart from you know, the relationship with his 14 year old student thing. Shudder.) That’s pretty impressive on Barnard’s part if you ask me, because really, sleeping with schoolgirls aside, Morgan’s pretty ordinary. & I hated him. I just, there is nothing about a guy that knowingly has that kind of relationship with a child that is fine, at all, and Morgan’s relationship with Fiona both then and now was just so problematic. She was a child. He was her teacher. She was a child. The thing is, the thing that I liked is that Morgan is nothing special; the whole story seemed to me to be about this kid (and later, this woman) head over crazy high heels in love with this guy that’s just a guy. To a degree that worked for me, narratively speaking I mean – it made the whole thing more real somehow, the idea of this schoolgirl falling for an older guy who made her feel special rather than for the hot teacher her friends drooled over; that he’s just a guy like any other and not some kind of superhero, it kind of made sense. I’m floundering a bit here, I know. I think, that’s the thing about that kind of crush isn’t it, that’s what a crush is, idolising somebody who really is just another person. Mr Morgan was just another person, just an average guy, Fee put him on a pedestal and he totally took advantage of that. And it made so much sense for it to be that way than for Mr Morgan to have actually been, I dunno, a Colin Firth lookalike. Do you hear me? Precocious made me feel things, and maybe those things weren’t the best things, but I’m totally calling this a job well done regardless: the point of a book is to provoke an emotional response, is it not? And it did. This is a book with a message, and it delivers it, even though both the main characters are pretty unlikeable, Morgan because he’s supposed to be and Fiona because I just couldn’t relate to her. I read it in three hours on a train because that’s the way I roll. It was an easy read and even though it was a frustrating read, it wasn’t a bad one. It’s compelling and it’s disturbing and I feel like I got out of it exactly what I was supposed to somehow, like the point was that your formative years are called that for a reason and when somebody has that level of control over you then, it’s going to have a lasting impact on who you are now and that really, any person who wishes to engage in a sexual relationship with a child (a fourteen year old is a child and you won’t ever convince me otherwise) – particularly one in their care - needs to be out of a job and probably in a prison cell. Precocious is published on Thursday by Ebury Press. You can get hold of a copy here.